Isn’t it funny how futurism has changed? Back when The World’s Fair presented a shiny plastic paradise to look forward to and Walt Disney designed the Tomorrowland section of Disneyland, the world embraced the concept of a utopia. We used to embrace the possible pleasantries of days to come with big goofy grins. Then science fiction changed and the genre was dominated by parables about how all the best laid plans can and will go wrong. 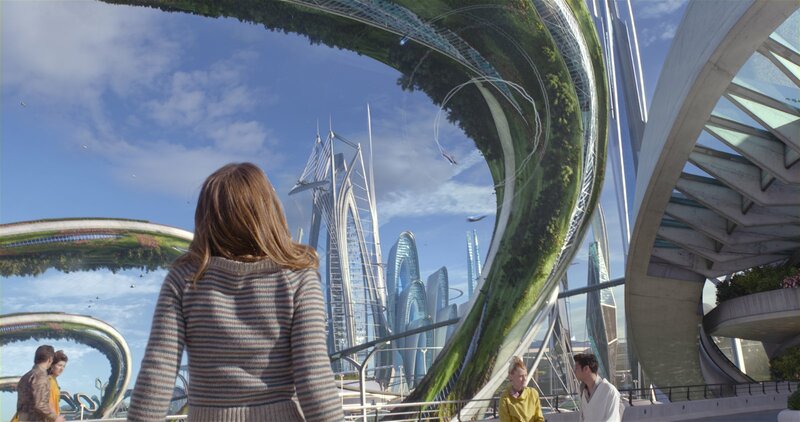 Brad Bird’s Tomorrowland embraces the gratingly commercial assignment of transforming a section of a theme park into a movie by creating a massive summer blockbuster that pleads for a reversion back to future optimism. Granted, he does so through a mysterious, rollicking, n’ wild adventure, but the hopeful message is clear and more importantly valid and important. Some may dismiss the movie as Disney sentimentalism and there certainly are flaws in the grand design to pick apart. Yet, you’ve got to admire the ambition and warm heart of the project, not to mention all of the delightful fun. A sputtering start n’ stop opening introduces us to two protagonists. Britt Robertson plays a plucky young teen in the current day with a wild imagination and deep love of space imparted by her astro-scientist father. 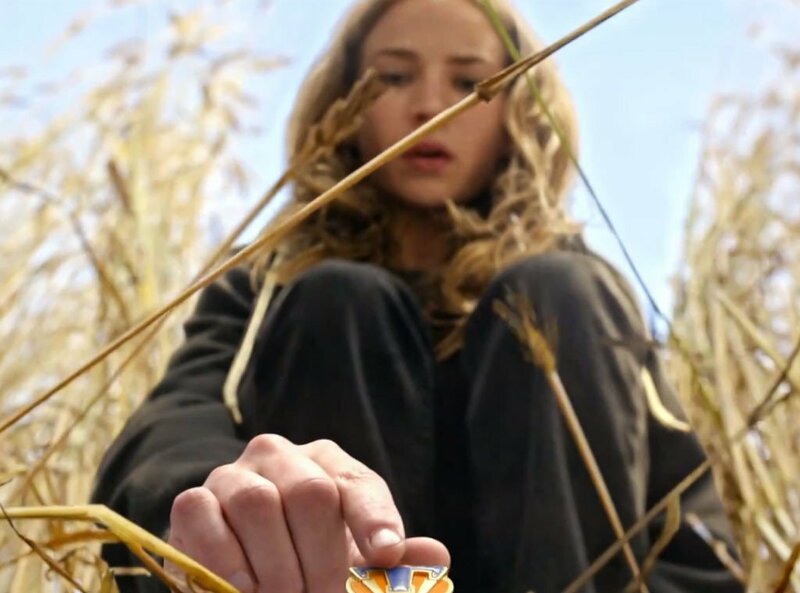 One day she’s slipped a pin by a mysterious young British girl (Raffey Cassidy) that transports her to the utopian Tomorrowland. 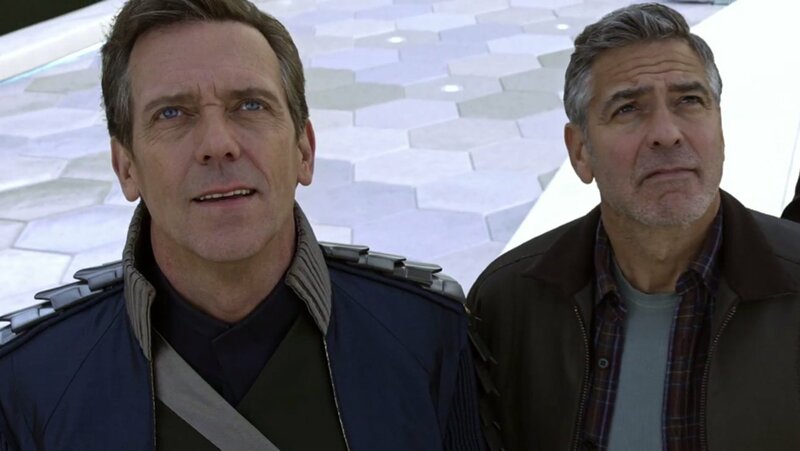 At the same time, we also meet a grouchy, grey-haired George Clooney who was also taken to Tomorrowland by Cassidy as a young boy, but eventually left when he discovered some sort of horrifying secret. Robertson must find Clooney with Cassidy’s help if she hopes to return and possibly save that wonderful world. At the same time, the trio are pursued by a creepy gang of uniformed Tomorrowland henchmen led by Matthew MacCaull. Revealing much more than that would be unfair. Bird and Disney have gone out of their way to conceal this film’s many secrets and it would be a mistake to violate that all too rare marketing strategy. 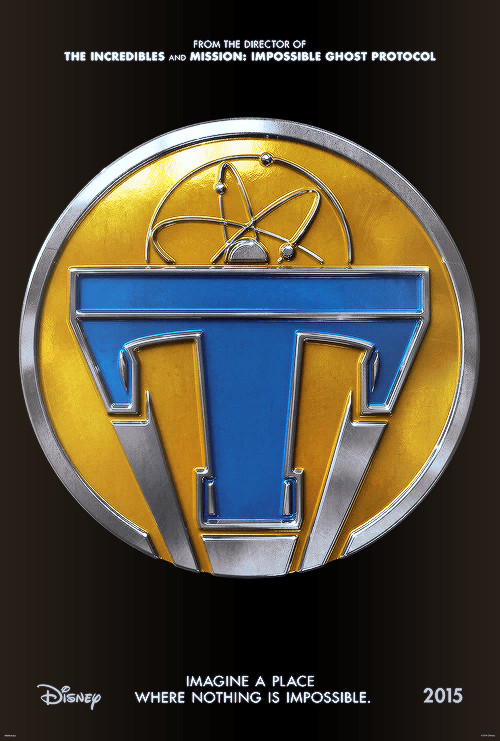 For those who have fallen in love with the sterling cinematic storytelling, wild adventure, and childlike sense of wonder that Brad Bird has brought to his previous work like The Iron Giant, The Incredibles, and Ratatouille, the tone and pace of Tomorrowland will feel pleasantly familiar. Bird rockets through the first 90 minutes of his film, seemingly constructing a narrative entirely out of set pieces and charmingly comedic character beats. Each of the major players is sketched out with almost cartoony relatability and easy humor, yet also with clear depth. Bird’s visual approach is kinetic. His cameras fly between scenes and sequences like a hyperactive child excited to tell you his new favorite story. It’s almost impossible not to get swept up in the spectacle, which is relentless and intense, yet retains a sense of childish glee. While the metal-crunching sugar rush action sequences thrust viewers deep into their seats, the warm characters and warmer ideas will pull them out and into a magical world. The cast all deliver charming performances with just the right mix of melancholic drama and exaggerated mirth. 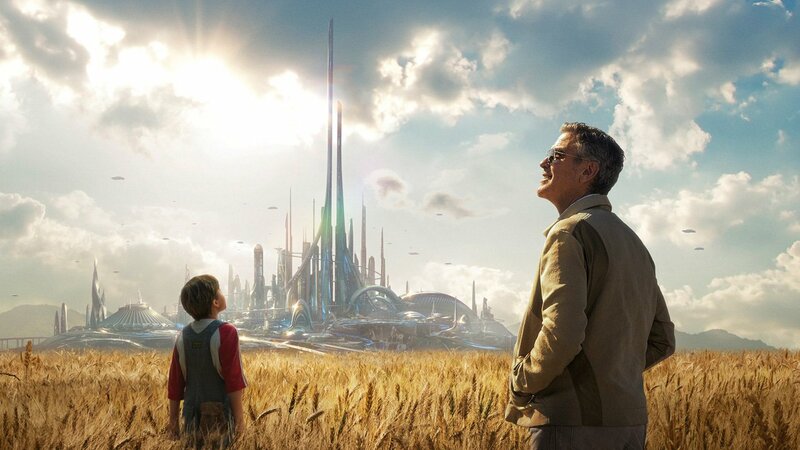 Combine all that with Bird’s charmingly old fashioned and optimistic take of future world storytelling and Tomorrowland feels like one of the most purely enjoyable adventure films to arrive on screens since the heyday of Amblin. Unfortunately, that fun can’t last forever. As exciting and electric as a mystery tale can feel in the middle of the ride, eventually everything must be explained. It’s here that Tomorrowland starts to break down. For those who know the name, all of the film’s failings should be explained by the influence of Lost and Prometheus writer Damon Lindelof on the screenplay. Lindelof has a remarkable gift for world building and first act concepts, but he’s never been able to adequately end or explain his tall tales. Generally speaking, Bird has a knack for endings but unfortunately he and Lindelof aren’t quite sure how to stick Tomorrowland’s landing. After the giddy sugar rush of the film’s first 90 minutes, the filmmakers crash hard into a swamp tedious speeches and exposition not unlike the infamous anticlimax of The Matrix Reloaded. What’s being said is indeed interesting (even though the critics who wrongfully attacked Bird’s as a closeted Ayn Rand disciple after The Incredibles will have more misunderstood fuel for their fire) and it’s nice to see a popcorn summer blockbuster conclude with ideas rather than CGI destruction, but there’s no denying that Tomorrowland stumbles across the finish line. Perhaps the filmmakers couldn’t quite figure out the finale until late in the process or maybe studio meddling forced their hands into over-explaining. It’s hard to say. Either way, the movie starts to sag right at the point in the narrative when it should soar. Still, given everything that goes oh-so-right in Tomorrowland, it would be wrong to dismiss the entire project because of a wonky ending. This movie is a far from a failure. It’s still a bright and beautiful trainset that only $190 million could buy and only a filmmaker as warm and gifted as Brad Bird could deliver. It’s hard to be this crowd-pleasing and this intelligent, but the filmmaker seems to pull it off with ease. The big question will be whether or not audiences will accept his vision this time. The flick certainly deserves to be a hit and is exactly the type of inspiring movie kids should see these days to wash that sour Hunger Games taste out of their mouths. However, it’s hard to say whether or not that will happen. The type of optimism and sci-fi Brad is peddling this time is out of date and uncommercial. Maybe kids won’t care (even though ironically it’s a movie that will make help them learn how to care). Sometimes a little blast of sincerity in an ironic world is welcome. And this is coming from a grade A cynic whose shriveled little heart is not easily warmed. Bird and co. must have done something right if they managed to even give me a sense of hope. One day she’s slipped a pin by a mysterious young British girl (Raffey Cassidy) that transports her to the utopian Tomorrowland.